Avon Grove NFL Flag League provides structured non-contact flag football leagues for players ages 5 through 18 during the spring and fall. All divisions are co-ed. NFL Flag Football (ages 5 through 18) is a 5-on-5 to 7 on 7 version of traditional flag football, in which a flag hanging from a waist belt must be snatched in lieu of tackling. Players from all areas are eligible to play in the Avon Grove NFL Flag Football League. Players age on September 1, 2019 determines league age for the 2019 spring and fall seasons. Registrations are only accepted on-line. Within two weeks after registration, a birth certificate copy (new players only) must be mailed to: PO Box 526, Avondale, PA 19311 OR faxed to: 317-853-3139. Each player will receive an official NFL Flag Football Jersey, a mouth piece and a trophy. Players keep the jerseys and mouth piece after the season ends. 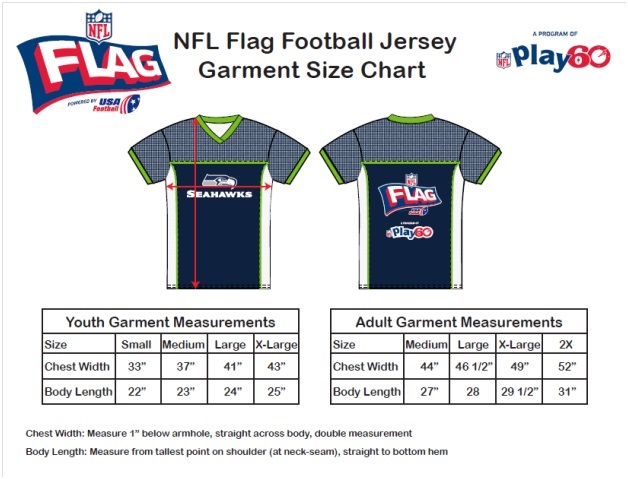 Please be sure to order the correct jersey size. Once shirts are ordered, they can not be exchanged or returned. Click here to view the shirt size chart. No other equipment will be required, players may wear non-metal cleats to games and practices. Tryouts are not be required. With the exceptions of Division 5, all players will meet for practice skills drill. Drafts will take place approximately 10 days after registration ends, usually in Late March for spring and late August for the fall season. Players will be placed on a NFL team listed within their age group. There are 10 +/- players per team depending on enrollment. All games will be held at 91 Parsons Road, Crossan Park, Landenburg, PA on Sunday afternoons. Practice schedules are up to the team coaches, most coaches will practice once or twice a week. Practices will start in late March for the spring season and late late August for the fall season. Spring season will open in early April and will run to early June. Fall season will open early September, and will run to the middle of November. Tournaments may be hosted at the end of the season. With the exception of division 5, all players are drafted one player at a time, teams or coach reguests will not be honered. Fees for Avon Grove NFL Flag will be $85 per player, payments must be made on line with a major credit card. Opening day activities will be announced. For additional information, email Jim Russell at: .